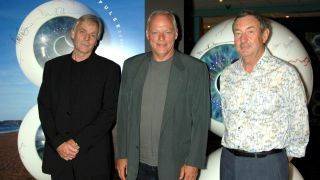 A pair of eyes used on the cover of Pink Floyd’s 2006 DVD release of live album Pulse will go under the hammer later this month. The props were commissioned by EMI and designed by longer-time Floyd collaborator Storm Thorgerson. They’ll be up for sale at Summers Place Auctions, West Sussex, UK on October 13. The pair are six foot high, three foot wide and weigh in at 50 kilos. They’re made of metal, plastic and paper and only 10 sets were ever created. The last pair sold a charity auction in 2006 for £16,500 and the latest lot is expected to fetch £6000-£8000. Thorgerson, who also designed artwork for artists including Def Leppard, Dream Theater, The Pineapple Thief, ELO, Rainbow, Scorpions and Muse, died in 2013 aged 69. Floyd released their final album The Endless River last year, while mainman David Gilmour has just issued his latest solo record Rattle That Lock.